The Dolly Blues welcome the Yorkshiremen to Giant Axe in the third qualifying round of the premier non-league competition. 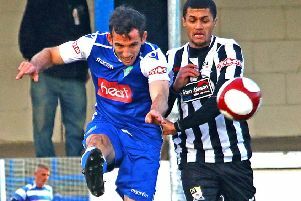 While Fell has no doubts that Guiseley – who are jointly managed byMarcus Bignot and Russ O’Neill – will be eager to progress when they cross over the Roses border on Saturday, he thinks their priorities may well be elsewhere. The following week they entertain League One outfit Fleetwood Town in the second round of the FA Cup – a clash which will be screened live on television. “It’s hard to tell whether Guiseley will have their minds on the Fleetwood game,” said Fell, who is hoping for a bumper crowd. “No doubt they will come and apply themselves and put in a performance against us. “They are a good side with good players. Their managers are very experienced. “We can’t expect that they are not going to be on their game or hope that they are not going to be at their best. Guiseley are currently in the National League North – the division above City – although they are struggling at the moment and are in the bottom reaches. “They have not had the best of starts this season, but they still have some very good players and we go into the game as massive underdogs. “They are big strong, physical side and if you think about it, they a full division above us in the football pyramid. “But there’s a real buzz about us at the moment. It’s a little bit of a free hit for us. “The lads have been absolutely fantastic in training this week. The Dolly Blues are currently on a three-match unbeaten run . After beating Ossett Town in the Trophy and then getting the better of Hyde United 2-1 in the league, City drew 0-0 on Saturday against Stafford Rangers at home. “When we took over, we had five points to our name, but we’ve now got 19,” Fell said. “We are definitely going in the right direction. “We have just got to makesure that we maintain the momentum and keep putting points on the board. Whether that’s a point or three points. “On Saturday, Stafford were down to 10 men at half-time so to only draw looks like a disappointing result. “But if you look at the teams in the bottom three, they all lost at the weekend so that’s another point further away from them. Squad wise, striker Matty Blinkhorn is expected to return to the squad after recovering from groin and hamstring injuries. Paul Jarvis is also expected to be available. 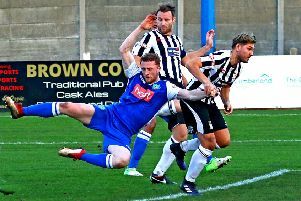 Lancaster City boss Mark Fell is hoping FA Trophy opponents Guiseley will have their minds on other matters this weekend.